This creed is called the Apostles' Creed not because it was produced by the apostles themselves but because it contains a brief summary of their teachings. It has received this title because of its great antiquity; it dates from very early times in the Church, a half century or so from the last writings of the New Testament. It sets forth their doctrine "in sublime simplicity, in unsurpassable brevity, in beautiful order, and with liturgical solemnity." In its present form, it is dated no later than the eighth century. More than any other Christian creed, it may justly be called an ecumenical symbol of faith. In its present form, this creed goes back partially to the Council of Nicea (A.D. 325) with additions by the Council of Constantinople (A.D. 381). It was accepted in its present form at the Council of Chalcedon in A.D. 451, but the filioque phrase was not added until A.D. 589. However, the creed is in substance an accurate and majestic formulation of the Nicene faith. The statements of faith that helped shape the Nicene creed are published below along with the Nicene Creed. And in one Lord Jesus Christ, the Son of God, begotten of the Father, only-begotten, that is, of the substance of the Father, God of God, Light of Light, true God of true God, begotten not made, of one substance with the Father, through whom all things were made, things in heaven and things on the earth; who for us men and for our salvation came down and was made flesh, and became man, suffered, and rose on the third day, ascended into the heavens, and is coming to judge living and dead. And those that say 'There was when he was not,' and, 'Before he was begotten he was not,' and that, 'He came into being from what-is-not,' or those that allege, that the son of God is 'Of another substance or essence' or 'created,' or 'changeable' or 'alterable,' these the Catholic and Apostolic Church anathematizes. In April 1530, the Emperor summoned a conference to achieve religious unity among his people. Since Luther was under ban and could not attend, the Lutheran statement was drawn up by his colleague Philip Melanchthon and privately approved by Luther. The statement was presented on June 25, 1530 to the Holy Roman Emperor Charles V and his Diet (Parliament) at Augsburg in the hope of reaching some kind of peaceful agreement between the Lutherans and the adherents of the Pope, and it stresses the beliefs which the two sides had in common. 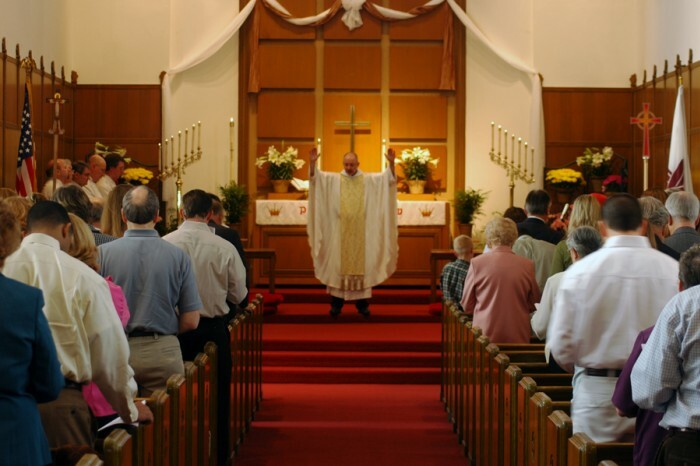 It repudiates the notion of change for the sake of change, and for example, denies the charge that the Lutherans wish to abolish the Mass, saying that the Mass continues to be celebrated among Lutherans, but with hymns and prayers included in German, in order that the people may clearly understand the significance of what is being done.